Chanukah is coming again, and by that I don't mean the secularized Chanukah of electric bulb Menorahs, plush teddy bears wearing Yarmulkes and foil wrapped chocolate coins, that has as much in common with the real Chanukah as the holiday shopping season has with any real religious holiday. By the real Chanukah, I mean the life and death struggle for the survival of the Jewish people under which a small band of Jewish extremists known as the Macabees employing by turns violence and political maneuvering, forced out the Syrian-Greek conquerors of their homeland and their Hellenized Jewish collaborators determined to embraced a secular identity in a prolonged struggle, and reclaimed the capital city of Jerusalem and the Holy Temple. Today the modern Jewish Hellenists who relearned in the 20th century, what the Hellenists of Macabees' days knew, that the best way to destroy authentic Jewish religious and national values, was to gut them from the inside leaving only a hollow shell. To leave the Temple standing but to fill it with pagan idols, to leave Synagogues in place but to transform them into pagan temples dedicated to the Democratic party, to leave Jewish Holidays in place but to stuff them with messages about consumerism, tolerance, the environment and whatever nonsense best represents their own borrowed belief structure. That is the essence of Hellenism, the subversion of Jewish beliefs and identity by turning them into hollow shells for their own agenda. And that agenda demands the destruction of authentic Jewish beliefs and goals. The original hebrew sums up the Hellenistic agenda best, whether it is that of the modern day "Jewish" liberal at Temple Beth Shalom or the ancient Hellenist cavorting in the streets of a defiled Jerusalem, LeHaskicham Et Torateha Ulehaaviram MeHukei Retzonecha. To Cause Them to Forget Your Torah and to Lead Them Away from the Laws you Willed. Today Jerusalem is on the verge of being divided and there is a new Antiochus whose images hang on the walls of Hellenistic synagogues, a new image to bow down to in a revived form of Emperor worship, Barack Hussein Obama, whose emissaries already speak of sending an international force to divide up what remains of Israel after a decade and a half of retreats and surrenders under Hellenistic government after Hellenistic government, willingly kneeling into place beneath the boots of mighty nations and empires. The one target they can safely vent all their wrath upon are once again religious and Zionist Jews, evicted from their homes, arrested and dragged into court on the thinnest of pretexts, libeled and smeared as extremists and the cause of all the country's troubles. Meanwhile abroad, the Hellenistic work proceeds apace. With the triumph of tyranny in the United States, J-Street, the left wing Anti-Israel lobby is set to displace the moribund AIPAC. 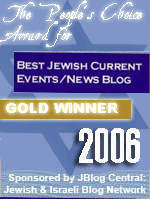 The Jewish in name only organizations that backed Obama, like the Rabbis for Obama, consist of extreme left wing anti-Jewish and Anti-Israel activists, who will now be the official political voice for and against Jews in America and around the world. And the ugly work is already coming about. Left wing "Jewish" media outlets, such as the Forward, whose founder Abe Cahan originated the American version of turning Judaism into a trojan horse for socialism strategy, and the JTA are trumpeting their war against Kosher meat, with the Forward actually serving as a source for the Iowa raid. The real issue here are not the Rubashkins themselves, but the reality that this was an attack on the weakest link in the Kosher meat industry. An opening shot in a larger war being more subtly waged by more trojan horse "Jewish" groups from large organizations to phony grass roots groups such as Uri L'Tzedek and Hechser Tzedek. These are just the farthest outcroppings of entire networks of phony grass roots groups aimed at destroying Judaism in America and funded by the usual suspects who are of course also working to promote left wing and anti-American causes. 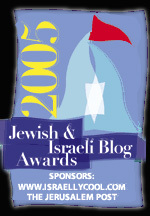 The modern day Hellenists in both America and Israel have seen the demographic writing on the wall, between generic assimilation, intermarriage and low birth rates, they lose, and the future in the normal course of events would belong to committed religious Jews with an actual Jewish identity, rather than a pathetic self-hating fealty to the furthest left wing extreme. Which naturally has kicked in their hate into overdrive. And has helped bring on this modern day Chanukah. In their misguided sense of self-preservation, destroying those Jews who possess a Jewish identity is their last best hope for ideological survival. And in the name of that internal demographic war, everything possible is being done to crush Religious Zionism in Israel. In the name of that demographic war, liberal "Jewish" groups in America have viciously sharpened their knives and gone after religious Jews in America while throwing the survival of Israel to the wolves. Today holding Jewish beliefs, the belief in the authenticity of the Torah and of the right of Israel to the land of Israel brands you an extremist. And so it is Chanukah again, that fast approaching window where respite, if not salvation, can be bought for a time, or all will crumble again and the lights of Chanukah will go out into the bitter darkness of exile. Make no mistake about it, it has happened before, and it can happen again. Even the victory of the Macabees was brief, a short respite, undone by treachery and the Hellenization of their successors, to lead them down into Roman slavery. So too the children and grandchildren of Herut stalwarts, such as Olmert and Rahm Emanuel have become the new Yannais, while the Haredim quarrel and squabble as they did then. The ultimate question of Chanukah is can we break the cycle. Both Purim and Chanukah are minor holidays ushering in minor salvations, great massacres averted and homelands briefly reclaimed. And other holidays, such as Lag Ba'omer, once known as Yom Yerushalayim, ended in far more precipitous defeats so that their original meaning has been all but blotted out, aside from a few torches lit today for a long dead scholar rather than for the liberation of Yerushalayim. But the time when such rhetoric was academic has passed already. We are headed into a dark time now, when we will either be broken or emerge more whole than we have ever been. One way or another we will survive, we have after all survived the fall of two Temples, and countless massacres for thousands of years, peaking but not ending, with what is known as the Holocaust. As long as a core of committed Jews remains who raise their children that way, we will survive... and the Hellenists will wither and pass away as they always have, the malice and hate of liberal Jews dwindling ultimately into futility and self-imposed extinction. The question before us, is will we survive as a proud nation in our own homeland or as scattered refugees moving across a hostile world, always seeking shelter and knowing always that each shelter is only a temporary expedient against the storm. We are not called upon to equal the Macabees, we are called upon to better them. If we take refuge in apathy or in the long-suffering belief that salvation is around the corner and nothing remains for us to do but to wait for it, then the darkness and the exile is waiting for us. In spirit our children can either be princes or beggars, or they can not even exist. The choice as always is up to us. "always seeking shelter and knowing always that each shelter is only a temporary expedient against the storm." And a new storm is coming. I hear it every time a commercial comes up and hussein says, "Change has come to America." I think that change means nothing but trouble for those of us who are Jewish. "Today holding Jewish beliefs, the belief in the authenticity of the Torah and of the right of Israel to the land of Israel brands you an extremist." Precisely. Those three things you mentioned are taboo in most Israeli mainstream media channels. People have gone to jail here for saying that Israel belongs to Jews, and that we are better off without those "citizens" who don't accept this. I wouldn't be surprised if Israel doesn't develop an entity akin to the House Un-American Committee, hauling in anyone and everyone they feel is un-Israeli (ie. not nodding their heads yes to expulsions, land for peace. Religious Zionists being black balled and arrested for incitement). From the post: The real issue here are not the Rubashkins themselves, but the reality that this was an attack on the weakest link in the Kosher meat industry. Vey iz mir, do you really think you know the minds and hearts of all the Jews, especially all the frum Jews, who were furious with Agri? We haven't been attacking kashrus (our own practice), but were defending kashrus from the attitude that more affordable kosher meat justifies jettisoning entire sections of the Choshen Mishpat, as Agri has been charged with doing. That's a chillul hashem, as is any case when people who are clearly frum Jews publicly break the law and hurt other people with little concern - that leads less educated people to look at such misbehavior and say that that is Torah and that is its reward. You may not like some of the groups that got involved in the Rubashkin scandal, but we all must - and do - stand up for our beliefs, even when others who hold the same beliefs are distasteful. I assume you don't believe that what Agri has been accused of doing is perfectly fine, or that the charges should be swept under the rug - if you do believe those things, that's one debate. However, maybe you don't believe the charges are true - I disagree, have lots to back up my beliefs, and think that their long history means I no longer need to automatically dan bekaf zechus. We can disagree on that, but please don't assume that, because I disagree with you, even though I keep strict kashrus I must be a Hellenizer secretly out to destroy kosher meat. Thank you. It was not frum Jews leading the attack, it was anti-Jewish groups, from the left wing to PETA, which equated Holocaust victims with animals. Few frum Jews involved in this, aside from fake groups such as Uri L'Tzedek, which pretends to be Orthodox. "You may not like some of the groups that got involved in the Rubashkin scandal, but we all must - and do - stand up for our beliefs, even when others who hold the same beliefs are distasteful." If you have the same beliefs as the Forward or PETA, then you are equally distasteful. That's one lesson of Chanukah among others. You missed my point about standing up for beliefs. Here's another example. Among the Christians who support Israel, there are those who explicitly say that they do so in order that all Jews be in the same place to be wiped out by Jesus as they believe is predicted in their scripture (before you say everything, of course, most evangelicals don't support Israel for that reason). Of course, I find those people's reasoning distateful, but my love for and support for Israel won't be any less because of them, since it has nothing to do with them. Same holds true with PETA. And sales of Rubashkin were dropping in a number of cities. What are the demographics of people who buy kosher meat? Do you honestly think that could have happened without significant numbers of frum Jews taking their business to other companies that they did not believe were committing chilul? Now I am curious - do you think the charges were not true, or insignificant? When Christians join in supporting Israel, they join in supporting Israel. When you join in working with anti-semitic groups in order to stop Kosher meat sales and unionize Mexican illegal aliens, you're working for their cause, and against other Jews. I'm arguing that Rubashkins' actions were a chilul hashem and responding to them was absolutely in Jewish interest. Which returns to my question, so I can better understand where you're coming from - do you think the Rubashkin charges are incorrect, or insignificant? And I assume this means that the OU was anti-semitic and against the interest of Jews? A Jewish response to the Rubashkins would have tackled the Kashrut angle within the frum world, rather than allying with anti-semitic and outright evil organizations that engage in vandalism and terrorism, and whose goal is to suppress Kosher meat. An anti-Jewish response would have involved allying with anti-semitic and outright evil organizations that engage in vandalism and terrorism, and whose goal is to suppress Kosher meat. The OU is politically correct and blows whichever way the wind goes. Chag sameach! May the light of the Chanukiyah inspire new miracles, in the days of old, in our times. Excellent post, Sultan! It puts together what I've been thinking, far more eloquently.